Proceedings of the Vertical Axis Wind Turbine (VAWT) Design Technology Seminar for Industry (SAND80-0984) is a 341-page technical document summarizing the USDOE’s research program into Darrieus wind turbines and its principal findings. Any experimenter, inventor, or promoter of VAWTs or Darrieus turbines of any variety should read the document—and others I’ve posted—in detail. 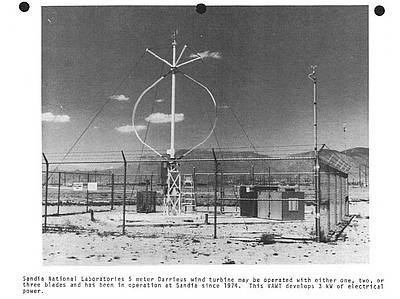 It is unlikely that any “modern” reinvention of Darrieus designs can perform any better than the experimental turbines Sandia and its contractors developed during the late 1970s and early 1980s. 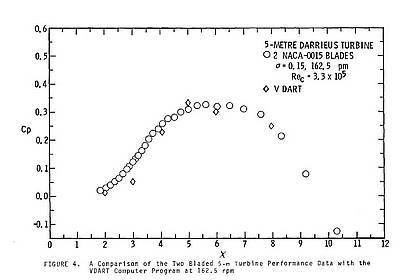 For example, Sandia measured the performance of its 5-meter diameter, two-blade Darrieus and found a coefficient of performance (Cp ) of more than 0.3. In testing the performance of their 17-meter diameter, two-blade Darrieus Sandia obtained a Cp of more than 0.4 at a tip-speed ratio of 6 without struts and with struts the Cp was, as you would expect, substantially less, but still well above a Cp 0.30. That’s excellent performance and probably the reason that Alcoa’s Paul Vosburgh was fond of saying that Darrieus wind turbines delivered as high performance in these terms as conventional wind turbines. That doesn’t mean the turbines would be more cost effective, more reliable, more bird friendly, or more attractive than any other wind turbine, only that the rotor’s aerodynamic performance was as good as conventional machines. Those of us who remain skeptical about the role of VAWTs today are always quick to point out that the rotors of Darrieus wind turbines can technically perform as well or nearly as well as those of conventional machines. I’ve included this document as part of series I’ve posted providing background on VAWT development during the 1970s and 1980s for those who want to investigate this technology further.